On the 2nd of June, King Juan Carlos I of Spain announced he would abdicate after a near-40-year rule. His son Felipe would take his place on the throne. Catavino looks back upon the life and times of Juan Carlos. Once upon a time, there was a prince. A Roman by birth, he entered Planet Earth as Juan Carlos Alfonso Victor Maria de Borbón y Borbón-Dos Sicilias. Juan Carlos was the first son of proud parents, Juan de Borbón, the Count of Barcelona, and Princess María Mercedes de Borbon-Dos Sicilias. So far, so Disney. Except this was no fairytale. The Borbóns did not reside in one of Spain’s majestic castles, as had been the birthright of their regal predecessors. For this was not your average royal household. The Spanish royal family were a royal family in exile. Juan Carlos’ father was heir to a throne that simply didn’t exist anymore. Not since the 14th April 1931 when Juan de Borbón’s pa, the moustached dandy himself, Alfonso XIII, was replaced as the head of government by the Second Spanish Republic. The Republic itself would fall, victim of Francisco Franco’s victory in the Spanish Civil War; of reactionary fear choking a brave new world. 1930s Spain pitted right-wing Nationalists against left-wing Republicans. Nationalist supporters were drawn from the ranks of dyed-in-the-wool monarchists, feudal landowners, business owners, the Church, and the army. The Republicans were the people. As in the workers, trade unions, socialists, and peasants. They were fed up with the unjust nature of Spain’s antiquated system which hadn’t progressed much since the Middle Ages, especially as the Wall Street Crash of the 1920s resulted in Spain’s own Great Depression. It was a battle between the haves and the have-nots. The haves who wanted to preserve the status quo and the have-nots who wanted their slice of the pie. The Civil War was not like other wars. Picture a Spanish priest and you’ll probably see an old man dressed in religious garb. However, the men of the cloth in Spain were, by tradition, the second sons of noble families. So think again, of younger and tooled-up clergy as the moneyed classes showed they weren’t prepared to lose their accustomed privileges without a fight. And who were these bloodthirsty clerics up against? Well, the likes of idealistic volunteers from overseas. The intellectuals, including the likes of England’s Laurie Lee and America’s Ernest, No-Stranger-to-a-Fight-Himself, Hemingway, sided with the left which included anarchist and communist elements. It was a more innocent world than the ethnic wars which would accompany the break-up of Yugoslavia towards the end of the 20th century, where foreign mercenaries charged for their services rather than offering them for free. Franco’s victory restored traditional order to Spain. It made the rehabilitation of the Spanish royal family a greater probability than the impossibility it had seemed under republican rule. To the extent that young Juan Carlos was able to continue his education on Spanish soil in a Madrid school, aged 10 in 1938. But we’re getting a little bit ahead of us. We need to step back and take a look at how the future Juan Carlos I ended up the heir apparent to his grandfather, Al the, unlucky for him, 13th. For a start, Juan Carlos’ father was not his father’s oldest son. Elder brothers Alfonso and Jaime both renounced their rights to the throne in 1933. Alfonso, who inherited his father’s film-star good looks but mother’s haemophilia, to marry a commoner. This was very much against convention as ordinarily royals tended to marry cousins. The equally striking Jaime, rendered a deaf-mute due to an epic fail of a childhood operation, meanwhile voluntarily gave up his rights and that of his descendants. Although later, as the Duke of Anjou, he was considered by some as the legitimate king of France. But that’s another story, for another time. Meanwhile, let’s get back to ours. The liberal-leaning Juan de Borbón was never accepted by Franco. There were also elements in the Nationalists who favoured a rival Carlist claim to the Spanish throne. So when the erstwhile Alfonso XIII sent Juan to participate in the 1936 military uprising that kickstarted the Spanish Civil War, Franco’s key commander General Mola saw to it that the royal was picked up near the French border and expelled from the country. 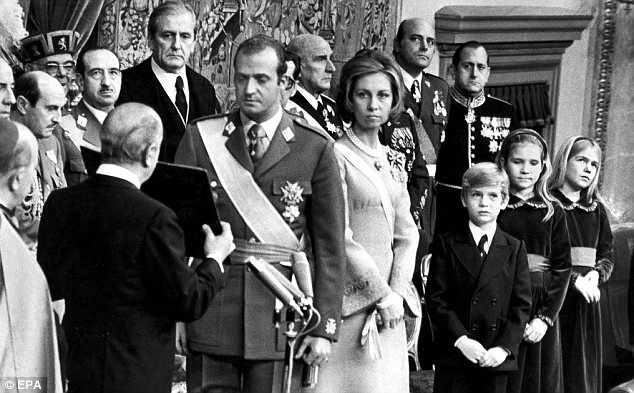 Franco, eager to ensure the Spain harnessed in his image continued after his death, named Juan de Borbón’s son, the thirtysomething Juan Carlos as his chosen successor in 1969. As a pre-condition of taking over, the young military man was made to swear an oath in support of Franco’s fascist regime. The dictator probably believed he could control the younger Juan with a greater deal of ease. He felt he was leaving his Spain in the safest of hands. Hands that had nevertheless killed his younger brother Alfonso at the family’s then residence in Estoril, Portugal, as a gun “accidentally” went off. Outwardly supportive of Franco, whom he stood next to during official state functions, Juan Carlos was actually speaking with the enemy. As he covertly met with opposition leaders living in Spain, and in exile, who were keen on reforming Spain. And whilst Juan Carlos may have been Franco’s heir, he was also his father’s son as he regularly conversed on matters of the State with Juan de Borbón on the telephone. Juan Carlos stood in for Franco as the latter’s health took a turn for the worse in 1974 and 1975. On his death bed in October 1975, the dictator handed over the reins of power to Juan Carlos who assumed full control a month later when Franco’s foot impacted with the proverbial bucket. To the dismay of Francoists, the king moved swiftly to democratize Spain. He removed Carlos Arias Navarro as prime minister in July 1976 for maintaining fascist levels of repression, replacing him with Adolfo Suárez Gonzalez. Just under a year later, Suárez became post-dictatorship Spain’s first elected prime minister. The efforts of Juan Carlos to present himself as a modern monarch, an approachable man of the people, did not go unnoticed by the left-wing parties. The leader of PSOE (the Spanish Socialist Workers Party) Felipe González Márquez met with the king as a show of support. This was a significant juncture in Spain’s history as PSOE had traditionally been a pro-republic party. Yet Juan Carlos’ defining moment came in his heroic reaction to what’s become known as 23-F. On the 23rd February 1981, rebel army members held the cabinet and parliament hostage for 18 hours. Interestingly, the coup led by Lt. Col. Antonio Tejero who can be seen firing shots over the heads of astonished MPs, thought it had the support of the king. However, in a subsequent television address to the nation, the regent refused the coup’s offer to make him an absolute monarch in favour of the constitutional monarchy he had already established, banishing the would-be revolutionaries to their barracks. But it’s when we start to examine what happened that winter’s day more closely that Juan Carlos’ halo starts to slip. Reports declassified by the German foreign ministry in February 2012 show that the king revealed to the West German Ambassador at the time that he could see where the plotters were coming from. Juan Carlos apparently was as dissatisfied as they were with Suárez, who he felt had consistently failed to offer a sympathetic ear to the military. Yet, because the public were not made aware of their ruler’s true feelings, his good standing continued well into the new Millennium. There have been numerous rumors of infidelity, following his marriage to plain Princess Sophia of Greece in 1962, but in the land of Julio Iglesias, a shagger’s more celebrated than condemned. 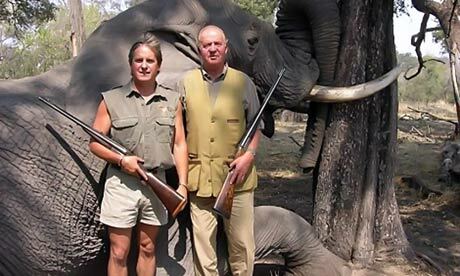 What the Spanish wouldn’t, couldn’t forgive was what took place on an ill-fated hunting trip to Botswana in April 2012. Being photographed next to a dead elephant cost him his honorary presidency of the Spanish branch of the World Wildlife Fund. But that cruel crime didn’t matter so much in a country where, after all, bullfighting is still legal, than the fact he broke his hip. Considering Spain’s economic woes, taxpayers were understandably aggrieved to be footing the bill for the king being flown home and his subsequent treatment in a private hospital. With age catching up with him, the king’s public apology saw the proud Juan Carlos acknowledging a fall in popularity. 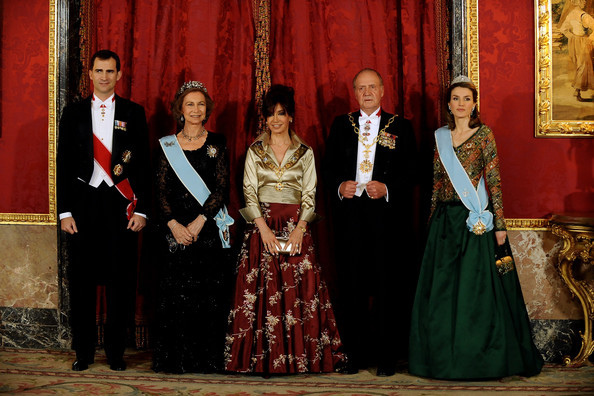 Already, the Spanish royal family were being viewed as more of a burden than a blessing. Thanks to the king’s son-in-law Inaki Urdangarin’s embroilment in a corruption scandal where’s he alleged to have appropriated public funds to set up sporting events for commercial profit. So, it shouldn’t be that much surprise to discover that the king leaves office with a fortune of 1.6 million Euros. After an uncertain beginning in life, this JuanCa has guaranteed himself a happy ending.